Any good company or business knows that keeping the customer happy is key to running a successful enterprise. Getting positive or negative feedback from customers is an integral part of running a successful business. Whether or not the customer is happy or unhappy is not as important as gaining the knowledge needed to better your company and make your business a more positive and professional environment! That is why it is a good idea to use a customer service survey within your business to get feedback from the consumers you are targeting. A customer service survey can indicate employee performance ratings, product satisfaction, and overall success within a company. 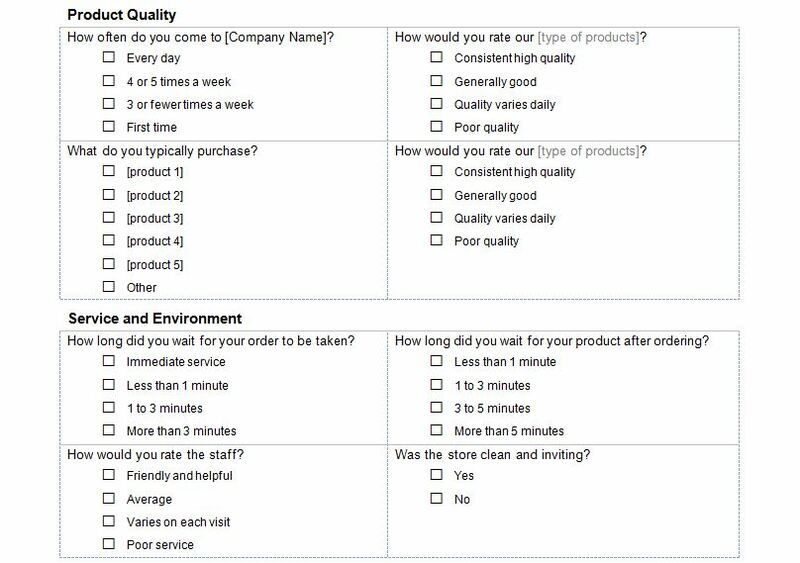 You can download an easy-to-use Customer Service Survey template, here, for free! Ensure that you are keeping your business at a level that warrants high customer service satisfaction! Simply input your company name and logo where indicated within the customer service survey template. The top questions in the survey are in multiple-choice format. This is beneficial to both you and your customers. When going through the survey, multiple choice is often times, the easiest and clearest way to understand what your consumers feel about your product or business. It is often an incentive to fill out the survey when your customers don’t feel pressure to write their own answers. The questions designated under product quality inquire how often the customer comes to the company/business and how positive they feel about the products they purchase. The questions designated under service and environment more specifically target the workplace environment and level of customer service within a company. There is room for additional comments so that if your customers do, in fact, want to give you extra information they have the agency to do so. There is also an optional section for the customer to include information about herself or himself for the company. Finally, there is a mailing list option. It is always a good idea to have a mailing list for your company so that you can quickly and easily access the clients who support your business! Download your free Customer Service Survey Template, here today!